Home » The Whole Damn Thing » New Background! Quint Returns! ‘Nightingale’ is Back on the Shelves! You might have noticed I upgraded my background recently. This is a portion of the amazing “Quint #1” cover by PJ McQuade. 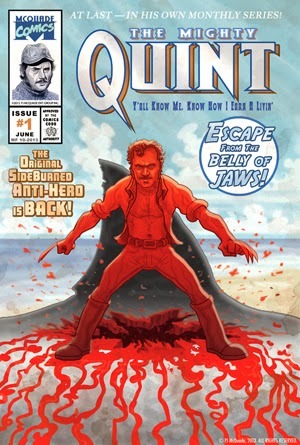 It’s based on Wolverine #1 and it is possibly the most perfect image EVER for a comic-centric blog where the URL and title consist of a Jaws quote from Quint. If you like nerdy, eclectic pop-culture wares, PJ is your guy. He’s got Lando Valentines in the store right now and I’m trying to come up with as big of a V-Day list as I can so that I can unleash them on as many people as possible. Check him out at Castle McQuade.